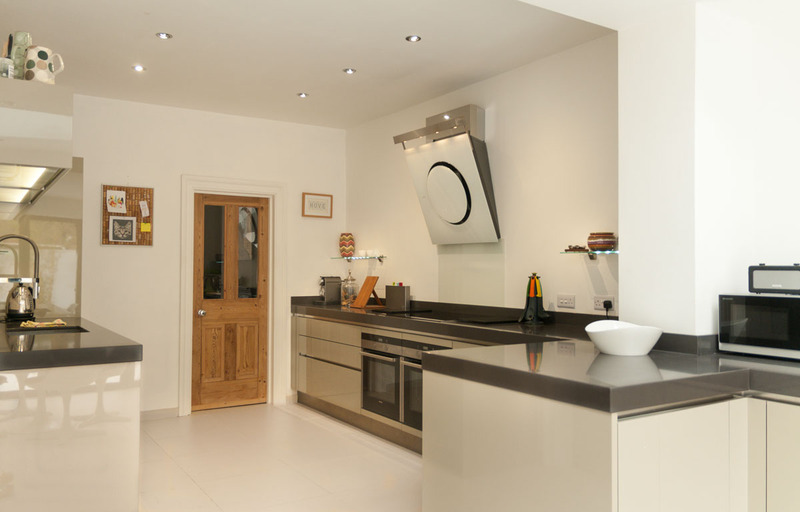 The key component with the design of this cubanite grey kitchen was to maximise the feeling of space and light. 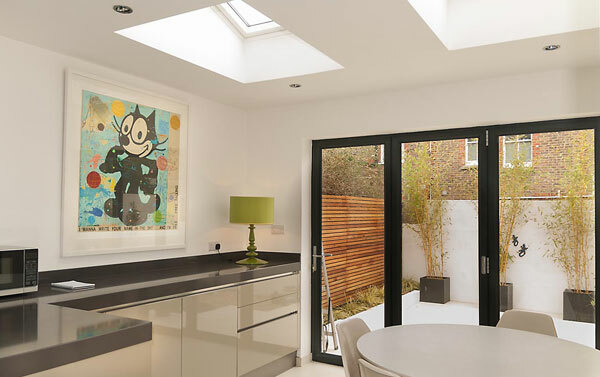 Our clients wanted the usual level of functionality within the kitchen space whilst also requiring a neatly concealed laundry zone in the new extension. The style needed to be subtle and elegant, allowing for the materials and finishes to add a touch of understated glamour. After a fair amount of exploration the shape that best suited the space focused on a single long run of cabinetry along the main wall. 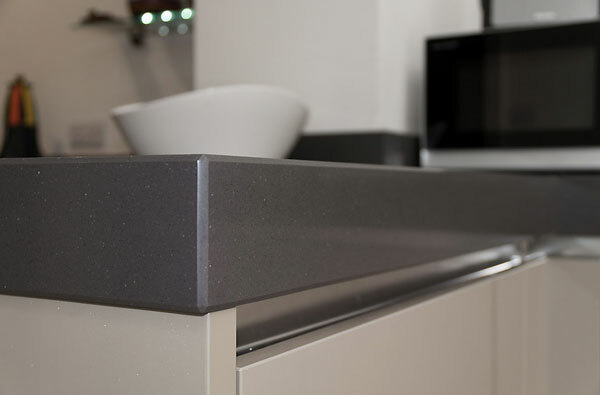 With no wall units or tall units this run was to be elevated above the ordinary with 80mm quartz worktops, sitting above the handle-less channel detail. This set a tone for the kitchen and blended the two spaces into one with the cabinets wrapping around the new opening. On the opposing wall the sink run featured the one tall unit, to house the fridge/ freezer, along with bins and the dishwasher. Two high level wall units provide useful storage whilst not interfering with the space above the sink. To add a further touch of glamour three simple LED illuminated glass shelves provide a little extra storage on both walls. 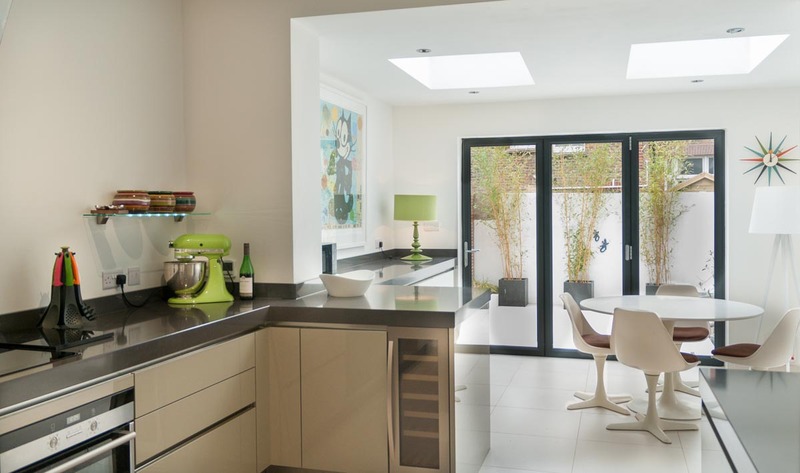 By keeping the main run of furniture to worktop height the space feels very open and light, whilst clever storage and fully integrated appliances ensure there is no compromise when it comes to functionality. The stainless handle-less channel detail and the worktops certainly elevate a very simple design to another level, whilst the sculptural Extractor hangs like a piece of art work above the hob. 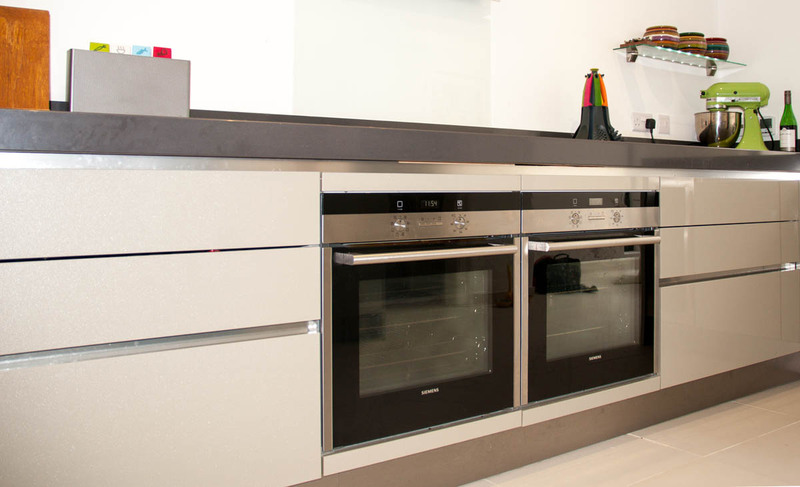 Elegance, simplicity and German functionality, mixed up with a little design flair… it’s another great Black Rok kitchen.